Pac-Maze (stylized PAC-MAZE in-game) is a stage that appears in Super Smash Bros. for Nintendo 3DS. This stage is based on the classic maze from the original Pac-Man game. It appears as an unlockable stage, obtained by completing the challenge in which the player must use Pac-Man's Final Smash. The stage consists of several blue-colored platforms based on the walls of the maze. 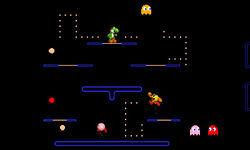 The Ghosts (Blinky, Pinky, Inky, and Clyde) also appear as stage hazards, along with Pac-Dots. Similar to the Coins in Golden Plains, collecting 100 Pac-Dots will cause a Power Pellet of the same color as the player who collected the Pac-Dots (such as red for player 1) to appear. Collecting it causes the ghosts to turn blue on the player's screen and become vulnerable only to that player; players are also capable of destroying an opponent's Power Pellet before they can collect it by attacking it. Fruits may also appear that the player can collect, which counts toward their Pac-Dot count. The Final Destination version of the stage takes place on a single platform, with a Pac-Man-style maze in the background. Composition: BANDAI NAMCO Studios, Inc. Composition: BANDAI NAMCO Games, Inc.
PAC-MAZE A stage where you can collect Pac-Dots and defeat scared ghosts, just like in the original PAC-MAN! Eating enough Pac-Dots will nab you a Power Pellet, which boosts your abilities in all kinds of ways. Attacks in particular get about 1.7 times as strong! If an opponent earns a Power Pellet, you'd better destroy it before they grab it. Pac-Maze, Flat Zone 2, and Rainbow Road are the only stages that appear in Super Smash Bros. for Nintendo 3DS that do not reappear in Super Smash Bros. Ultimate. This page was last edited on January 9, 2019, at 15:06.